If an unexpected emergency or disaster hits, are you prepared to leave your home--fast? You will be if you follow the advice in this book. This book shows you how to create a self-contained disaster preparedness kit to help you survive your journey from ground zero to a safer location. Survival expert Creek Stewart details from start to finish everything you need to gather for 72 hours of independent survival--water, food, protection, shelter, survival tools, and so much more. 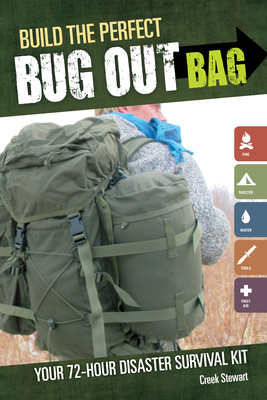 Creek Stewart is the author of Build the Perfect Bug Out Bag, The Unofficial Hunger Games Wilderness Survival Guide, Build the Perfect Bug Out Vehicle, and Build the Perfect Bug Out Survival Skills. Creek regularly publishes articles relating to disaster preparedness in numerous magazines. He owns and is Lead Instructor at Willow Haven Outdoor--a survival, preparedness and bushcraft school located in central Indiana. Creek specializes in disaster preparedness and has consulted with individuals, corporations, non-profits and government agencies all over the United States about a myriad of preparedness-related subjects, projects and initiatives. He has been featured on Fox & Friends and is host of Fat Guys in the Woods on the Weather Channel.